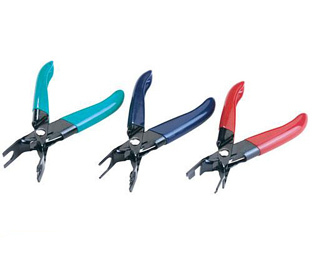 Fuel line disconnection pliers are used to remove and replace fuel connectors during replacement of fuel filters. Fuel line disconnection pliers are like ordinary pliers with half-circles on the end. To use this tool close one end around one side of the fuel filter (having first removed the clips on either side of the filter, where the fuel line joins by overlapping each nozzle of the filter). While holding the tool closed, slide it toward the attached line. The tool should go under the line and push it off. Repeat for the other side.